Making a short detour from our everyday-car spy images, we discovered this scoop photo on the movie website, Latino Review. 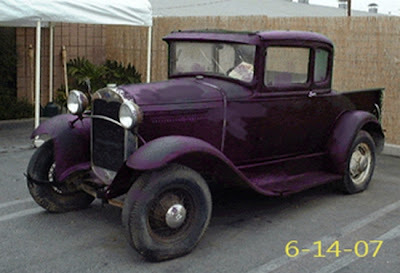 According to the author, Joker will use the purple-colored 30â€™s pick-up truck in the sequel of Batman Begins, â€œThe Dark Knightâ€ which is due for release in July 2008. True or not, the pick-up looks so out of place and messed up that we couldn’t imagine anyone else driving it but Joker.